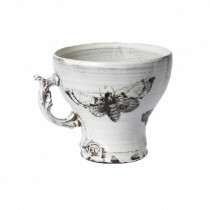 Elisabeth is a Swedish ceramicist who uses dark earthenware clay that is wheel thrown. The pieces are covered with slip and screen printed motives are added prior to the bisque firing. She uses images and drawings to create patterns and screen prints them onto a transfer paper using ceramic pigments. 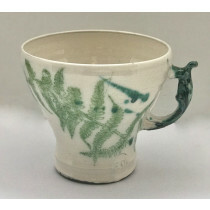 The ceramics are then coated in a clear glaze and fired at a high temperature. The dark clay shines through the white slip and creates depth, adding decoration in different layers gives more complexity to the surface. Elisabeth is influenced by music, mostly classical pieces from the baroque and classicist era. Film is also a great source of inspiration. Nature and time impact her work; she is fascinated with the short lived beauty nature gives us.